“Tides Of Malediction”, the debut from UK romantic dark metal band Swords Of Dis, conclusively proves the strengths of angelic female vocals within a metal context. Traditional in genre and composition but technical in delivery the album manages to combine two unlikely subgenres in a cohesive whole. One part Death, one part early My Dying Bride, but with soaring vocals not unlike early Theatre Of Tragedy “Tides Of Malediction” is a record that knows where it comes from, and isn’t afraid to glance a look into the future. Frontwoman Alice Collins is the best thing to come from England since Hungarian transplant Julie Kiss from technical metal act To-Mera a couple of year prior. The band takes its name from the city that encompasses the sixth through ninth circles of Hell in Dante Alighieri’s “The Divine Comedy”. In fact Alighieri’s tome seems to have left a considerable impression on both members, as artwork, lyrics and music work in unison to complement the overall theme. The introspective and downtrodden lyrics about love, longing and hurt are written far better than most. The literary references seem to end there, and the entire album exudes a sense of sophistication, reservation and intelligence that is absent in most contemporary metal releases. Its complete lack of pretentiousness is disarming, especially considering that virtually every metal band is looking for a hook, or gimmick to pass itself off as novel, or noteworthy. This isn’t the case with Swords Of Dis, who are able to sell their product on its musical merits alone. Swords Of Dis is a young duo from industrial hub and one-time death metal capital Birmingham, England that has taken a tried-and-true formula into an exciting new direction. The band takes cues from technical metal as well as death/doom, but avoids the usual stylistic trapping of both genres effortlessly and elegantly. The record’s strength lies in its emotional resonance rather than its heaviness. Swords Of Dis, on this recording, consists of vocalist/lyricist Alice Collins and multi-instrumentalist Richard Corvinus. “Tides Of Malediction” is the duo’s first recording venture that was independently released and promoted through its own label Insidious Voices. There’s a distinct non-metal aura that looms over “Tides Of Malediction”, most of which comes from Collins’ vocals. 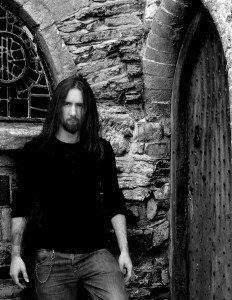 The album would have worked wonderfully as a singer-songwriter record, or a neo-folk venture – and most of the actual metal elements are secondary to Collins’ vocal presence. She certainly has the potential to venture out as a solo artist under her own name with the guidance and experience of the Insidious Voices collective. “Tides Of Malediction” operates at a slightly higher than usual tempo for doom standards, and the percussion is often quite busy as well. While Alice Collins rightly is the center of attention on this record, her soaring vocals never stray into the realms of the absurd. The whole record is characterized by a sense of reservation, something that is often lost on most female-fronted bands within this particular branch of metal. That reservation is what makes Swords Of Dis so much more remarkable than its more marketable peers. Everything is here for a reason, and nothing is set up without climax or payoff. A complete lack of pretentiousness from all involved makes “Tides Of Malediction” appealing on the merits of its considerable emotional honesty alone. The juxtaposition of female-fronted romantic doom metal against a backdrop of technical death metal reminiscent of “Symbolic” era Death is a breath of fresh air. The fact that the whole is produced like a breezy singer-songwriter record makes it so much stronger. All preconceived notions about how both genres should sound become obsolete as “Tides Of Malediction” stridently defies conventions and tropes at virtually every turn. There has long been an inclination in the British death/doom metal scene to go for an overall more romantic direction. The most famous example of this is probably My Dying Bride’s 1995-1996’s duo of “The Angel and the Dark River” and the fairly upbeat sounding “Like Gods Of the Sun”. Much like those famous records before them the duo play an atmospheric, darkly romantic dark/doom metal variant with truly mesmerizing female vocals. What Swords Of Dis play is hardly innovative, but the way they go about it is better than the great majority of their peers. They also do far more with less. Besides a few atmospheric enhancements everything is done through the usage of solemn melodies, percussion and Collins’ emotive and heartfelt vocals. Unlike a lot of their contemporaries the band doesn’t feel the need to make Collins the center of attention, nor the heart of its promotion campaign – instead they let the product speak for itself. Collins’ versatility as a singer is further cemented by her appearance on recordings from Insidious Voices label mates and fellow doom metallers Aeurtum, most recently on that band’s second album “The Depths Of Which These Roots Do Bind”. It wouldn’t be all that surprising to see Collins eventually branch out into more serene and tranquil genres. The biggest forte of Swords Of Dis, and this debut is in the ways that it breaks with tradition and expectation. 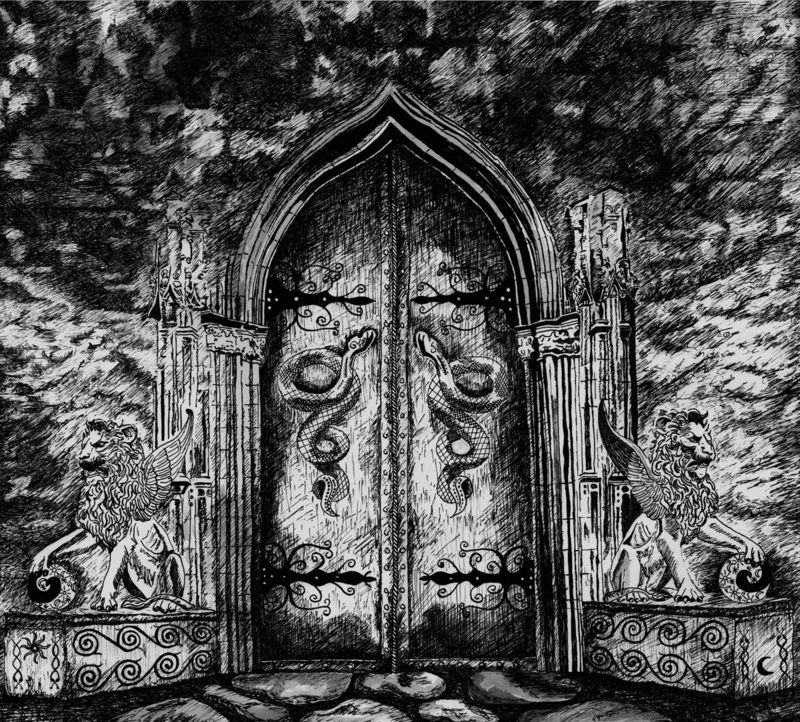 The handdrawn cover artwork by Ann-Marie Trahearn is hardly typical metal, and could have appeared on any folk, or singer-songwriter album. Likewise is the production courtesy of Loud Noises Production Recording and producer/engineer Owen Davies incredibly breezy, and light sounding. The closest comparison possibly being a merger between the organic crunch of My Dying Bride’s “The Angel and the Dark River” and Death’s seminal “Symbolic” album. In the same vein is the combination of technical metal with traditional doom a combination not heard often, and seldomly does a band such a convincing job of it on its maiden venture. Collins is a wonder to hear, and it makes a person wonder what she could be capable of without the imposing restrictions of the underground metal genre. She would truly shine within the context of a neo-folk unit, acoustic pop or even as a solo singer-songwriter. The times that a new metal band debuts as impressively as Swords Of Dis do here are far and few. “Tides Of Malediction” is a solemn reminder that one shouldn’t look to the established brands for quality material, but that true talent is there where you would least expect it. If this any indication for the future, the duo’s potential as musicians and songwriters is in full bloom, and their defining record is but a few years away.